"Greater pastoral attention must be given to the role of men as husbands and fathers as well as to the responsibility which they share with their wives for their marriage, the family and raising of their children." "Speaking to the Heart is a great encouragement to men who want to be better husbands and fathers. It is both a practical job description of fatherhoodshowing how fathers build strength in their childrenand an inspiring call to family leadership. Any father who takes this book to heart and puts its wisdom into action will be known to his children as a great man." James Stenson, lecturer and author of Father, The Family Protector, Compass: A Handbook on Parent Leadership, and Anchor: God's Promises of Hope to Parents. "Pope Pius XI told us in his encyclical on Christian marriage that men are the head of the family and women are the heart. 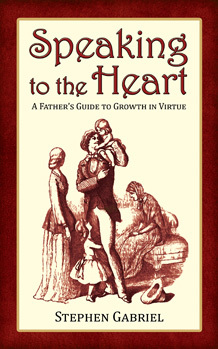 In this wonderful, little, and affordable hardbound book, Speaking to the Heart: A Fathers Guide to Growth in Virtue, (Our Sunday Visitor, 1999) the author Stephen Gabriel speaks to the heart of Christian fathers." The Reverend C.J. McCloskey III, a priest of the Prelature of Opus Dei. He currently is Research Fellow of the Faith and Reason Institute in Washington DC. From 1985-1990, he was a chaplain at Princeton University. His most recent book is The Essential Belloc: A Prophet for Our Times. "Speaking to the Heart is a most practical guide to the biggest work any man can take on: raising his children. But it is more than a practical book, it is very solid, for it outlines the virtues each man must acquire if he is to be a good father, if he is to develop the character he needs for the job. It is based on the three supernatural virtues of faith hope and charity, the four cardinal virtues of prudence (balancing the virtues), justice, fortitude/ courage and temperance (appropriate use of the means). Some other virtues special to fatherhood get extra attention: patience, integrity, cheerfulness, perseverance, friendship, and (few would think of this one): poverty or detachment. Each chapter is short enough to be read through in two or three minutes, but yields enough for hours of reflection and meditation, and leads to very practical resolutions to be put into practice that very day. " There's a crisis of fatherhood in our culture today. It's a spiritual problem that challenges even the best homes. The only cure is within each dad. But this book goes a long way in developing the inner strength of individual dads". Pope Pius XI told us in his encyclical on Christian marriage that men are the head of the family and women are the heart. In this wonderful, little, and affordable hardbound book, Speaking to the Heart: A Father's Guide to Growth in Virtue, (Our Sunday Visitor, l999), the author Stephen Gabriel, speaks to Christian fathers and he knows of what he speaks. As he says of himself, "At work I am an expert, by profession an economist for the U.S. government. At home no one thinks I am an expertespecially me. My wife, Peggy, and I now have eight children. I regard my work as a father as the most important thing I do, but like most fathers I have no special training for it...I'm a man who takes his role as father very seriously. My chief goal is to help my children to be mature, well-adjusted Catholic men and women who take their faith very seriously. I want to help them get to heaven. I'm a man like you." Gabriel's approach to this task is to invite the Christian father to make an extended examination of conscience by looking at twenty character traits that he thinks are important to the lives of a father and his children in light of the classical seven virtues Gabriel quotes a dictionary definition for virtue: "moral excellence and righteousness; goodness" and cites the theological virtues faith, hope and charity, and the cardinal virtues: prudence, justice, temperance, and fortitude. Each chapter opens with an appropriate quotation from Scripture and secular literature followed by a page long explanation of a character trait. He then follows with the considerations for growth in the virtue that develops that trait. As he says, "Some of what you read here will make you uncomfortable. Pay attention to that. Your discomfort is a piece of wisdom. The problems of fathering are not so much the difficulties we face, but the way we handle the difficulties we face...Failure makes us more humble and dependent on almighty God. Our prayer and effort help us to grow in virtue and become the example that our children need." In choosing this approach Gabriel must have been mindful of the advice of another point from the Catechism: "The home is well suited for education in the virtues. This education requires an apprenticeship in self-denial, sound judgment, and self-masterythe preconditions of all true freedom. They should teach their children to subordinate the 'material and instinctual dimensions to interior and spiritual ones.' Parents have a grave responsibility to give good example to their children. By knowing how to acknowledge their own failings to their children, parents will be better able to guide and correct them." The Catechism also tells us that "the fecundity of conjugal love cannot be reduced solely to the procreation of children, but must extend to their moral education and their spiritual formation." In these sad times of abortion, small families, child abuse, high rates of illegitimacy, and school shootings, people are realizing increasingly that the ultimate answers to resolve these problems which are weakening our society to the point of breakdown can only be grace and virtue. While social factors are important and can provide partial explanations for some of our problems, only a change of heart and mind can over time create a culture where it is easier to be virtuous because one does what one ought and not simply what one wants. It has been said again and again by experts in the field of family dysfunction that such a change must be made in the role of the father, who in our present day society is often absent, weak, distant, or abusive. If you are a father, future or present, buy this book. If you are a wife or an engaged woman, give this book to your husband or fiance. There can be no more fitting present for Father's Day in the year of God the Father. As the Holy Father put it, "The future of the Church passes through the family." That future, in part, depends on our personal commitment to better ourselves in the virtues so we can more effectively serve God and others. First appeared in The Catholic Herald (Arlington, VA) in the June 24, 1999, issue.